#G21 Stoddard-Dayton driven by A.R. Miller. Finished 3rd. #G22 Chalmers driven by L.B. Lorimar. Finished 6th. #G24 Palmer-Singer driven by Ray Howard. Finished 7th. #G25 Stoddard-Dayton driven by H. Tuttle. Finished 5th. #G26 Buick driven by Robert Burman. Finished 4th. #G27 Knox driven by William Bourque. Finished 2nd.Declared the winner in March 1909, after the Sharp-Arrow was disqualified. 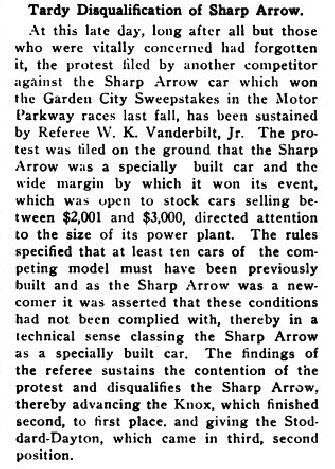 As noted in the March 11, 1909 issue of The Motor World, months after the race the Sharp-Arrow racer was disqualified and the Knox was declared the winner. Forwarded by Ariejan Bos.